At Fields Family Wines our wines will always be made in small lots, handcrafted and of the highest quality – it has to be, especially when your name is on the bottle. Our goal is to craft wines that showcase the vineyards from where they come and employ a minimalistic approach to winemaking. Grape growing and winemaking should go hand in hand – as winegrowers we seek to enhance this relationship. Wine is meant to be enjoyed with Family & Friends – join us! Russ Fields – Owner Russ and Melinda purchased the property in 2005 and immediately set to work on the restoration of the property and construction of the Winery, the Main House and second residence. From the very beginning Russ saw the potential in this piece of land and knew exactly what he wanted to accomplish in starting a winery. 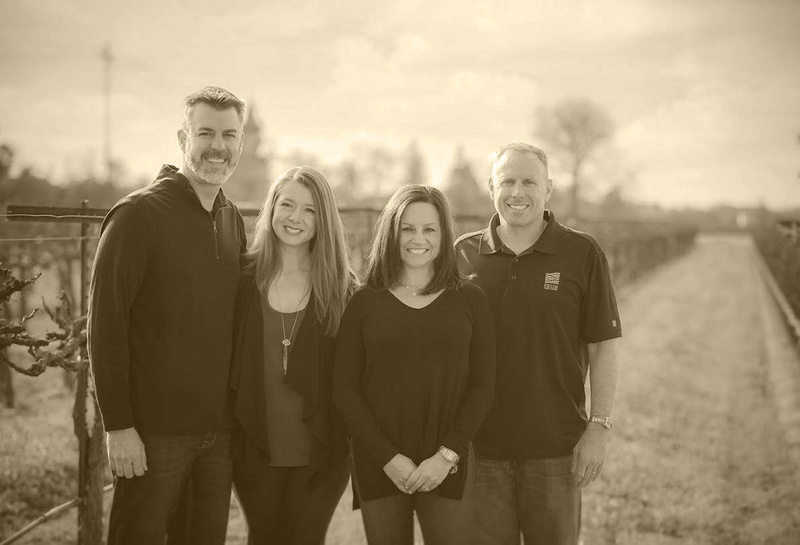 Ryan Sherman – Winemaker & Partner, Ryan and Jalynn met Russ and Melinda in 2004. Ryan’s day job is a Realtor, he helped the Fields Family find their property. He was not so gently pushed into winemaking by Russ, given his passion for food and wine and his prior life in Pharmaceuticals, Russ knew what Ryan didn’t. Ryan is self-taught and self-trained as a winemaker.